As I mentioned a bit ago, I haven’t been eating all that well recently. Evening classes are hard to arrange eating around! I finally finished that gigantic pot of paella so now what? I decided if I cooked an insane amount of food, I wouldn’t have any excuse to eat Crispix for dinner again (but seriously, Crispix are delicious even when not coated in chocolate and powdered sugar). So, this became a weekend of cooking. And dish washing. First: bake two loaves of bread. Have I mentioned how much I love Artisan Bread in Five Minutes a Day enough just yet? I do. You should buy it. And buy it for your mom, and cousin, and neighbor. Everyone should have it. Then I cut up those loaves and made a crazy amount of croutons. I made so many that I put some in the freezer. 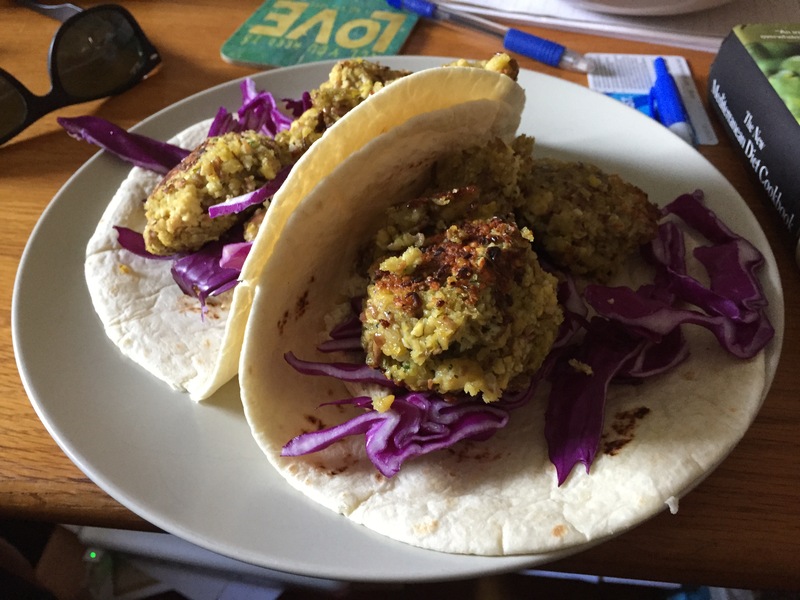 For years I’ve been wanting to make falafel but have been intimidated.This weekend seemed as good a time as any. Turns out, it’s not so hard. Quite awhile ago I bought The New Mediterranean Diet Cookbook but haven’t actually use it for anything until trying out the falafel recipe. Why not add in some quinoa salad? Healthy, easy to eat, doesn’t need reheated – it’s even easier than Crispix. I don’t have to open cereal and milk, I just have to open the single serving Pyrex container and get a spoon! …and some freshly baked hamburger buns for my black bean burgers. Totally worth it. Way tastier. Yep…I used tortillas…seemed more versatile than buying pita. And, obviously, some hummus. Hummus and falafel go together like peanut butter and jelly? Macaroni and cheese? Gin and tonic? 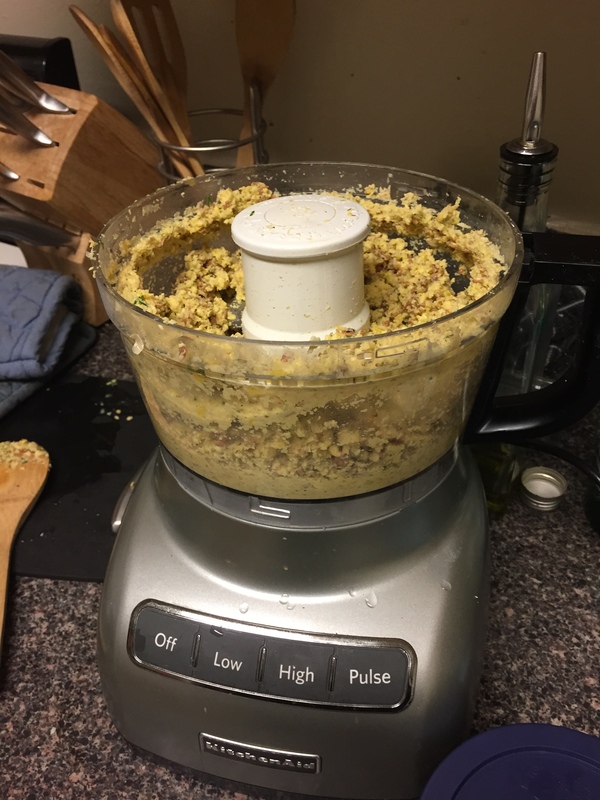 I forgot, again, to save some of the liquid from the chickpeas so I think the flavor could be richer but oh well. Next time I’ll (try to) remember. And somehow I used up all of my flour. How did that happen? It seems like I just bought those 20 pounds of flour yesterday. All of it. No flour left. Zippo. I guess a return to Costco is going to have to happen soon. Oh yeah, since this is a fitness blog, I should probably mention Saturday’s lazy run and the double spin classes on Sunday followed by a 7 mile Mass Ave run with Alison. The playlist I created for spin classes this week is amazing – stay tuned!